Homemade gifts are always cherished and add a personal touch to the season of giving. They’re also easy on the pocketbook, and we know that will appeal to lots of you out there in these tough economic times. Since we all have different levels of craftiness, we’ve listed our DIY gift ideas here in order of complexity: simpler DIY ideas for the novice are at the top and projects for seasoned crafters at the bottom. Many of these projects require buying fabric or other raw materials. Keep it green by choosing organic, local, pre-loved or sustainably sourced goods. With nearly no effort these MOO personalized paper gifts are only semi-homemade. 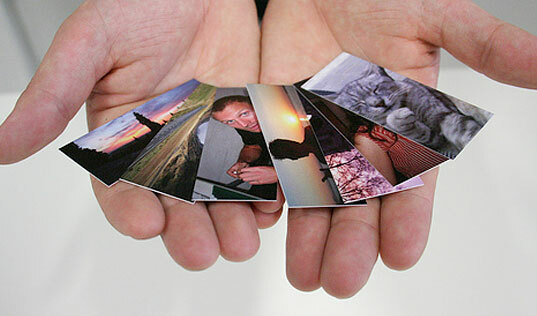 Upload up to 50 photos or images to create personalized business or note card sets. While all MOO paper is FSC certified and chlorine free, MOO Green is %100 recycled and biodegradable. Ideas? Upload photos of a recent trip you took together or turn the budding artist into a professional with cards featuring their art. 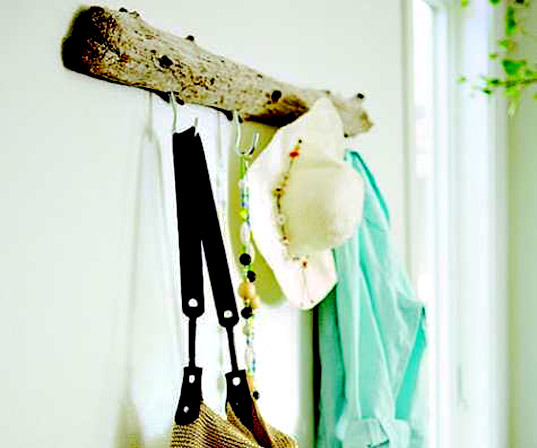 This simple project can easily be a rack for keys, coats or jewelry, depending on the size of wood and hook placement. Find any stray piece of wood at the beach or in your neighborhood. Get some hooks and a mounting bracket from your local hardware store and voila. Have a look at Yellow Canoe for more inspiration. This one’s pretty much a no-brainer, or perhaps a nice project to do with the kids. Buy some magnets (or reuse all those pizza place and real estate adverts) and start gluing. You can really use anything here, make flowers out of fabric scraps or glue on thrift store tchotchkes, or even pinecones or nuts. Get creative with this one, or just use the tutorial below. Perhaps you’ve got someone on your list that a handmade gift just couldn’t satisfy and you relinquish all craftiness to a gift card. Its ok, it happens. But when it does, put some effort into a nice, stylish case from old cereal boxes and gift wrap. Rescue some vintage teacups from your local thrift store and convert them into light-giving candles. Be sure to put to use those old candle remnants that no longer have a wick! Heres a vintage tutorial from the Inhabitat archives. Make a whimsical terrarium for an earthy friend trapped in urbanland. Wildly customizable and difficult to transport, assemble this on site or just before the giving begins. 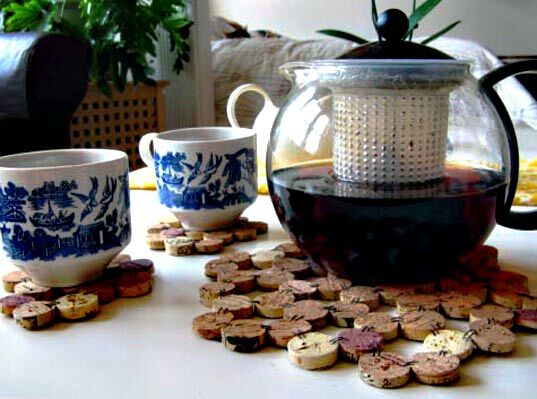 If you think you can make it through 10 or 12 bottles of wine in the coming weeks, then the cork trivet project is right up your alley. Cork is an excellent raw material that all too often gets tossed after the bottle hits the recycling bin. Put it to good use and knock off another gift on your list. Embroidery hoops make lovely eclectic frames for your favorite fabrics. 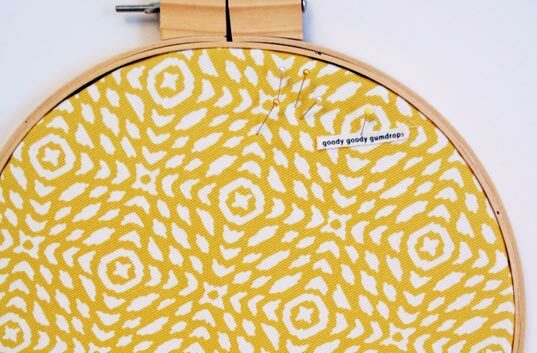 Find thrift store leftovers or use your own project scraps to make a collection of embroidery hoop wall art. As an added bonus, these are easily adaptable for seasonal or style changes. Make a personalized cookie cutter for your favorite baker. Choose any shape you like and grab an aluminum pan. Any leftover scraps can be recycled as can the cutter when its out of commission. Growing up in the Northwest has definitely made me a coffee snob, and I prefer a French press when my morning laziness doesn’t succumb to the auto brew button. And any fellow coffee snob will know, despite the fact that French pressed coffee tastes delectable, it’s only tepid by the time you get to your third cup. 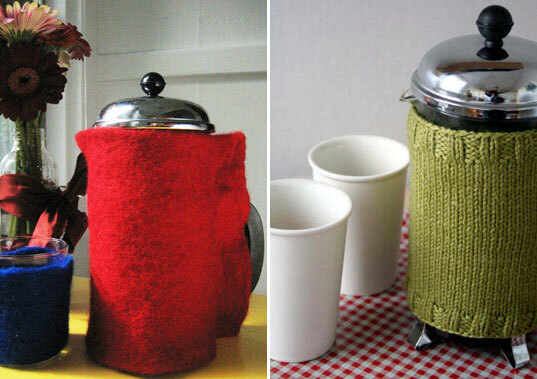 The solution: a French press cozy. Here are instructions for a knit version and a felt version. If you’re pressed for time (or skill) bypass making the felt and just buy some. Build a birdhouse out of a gourd. It has been said that these types of birdhouses attract Purple Martins, a type of swallow that eats mosquitoes, so these make excellent gifts for bird lovers and mosquito haters alike. They’re fairly easy to whip up and, of course, natural and biodegradable. 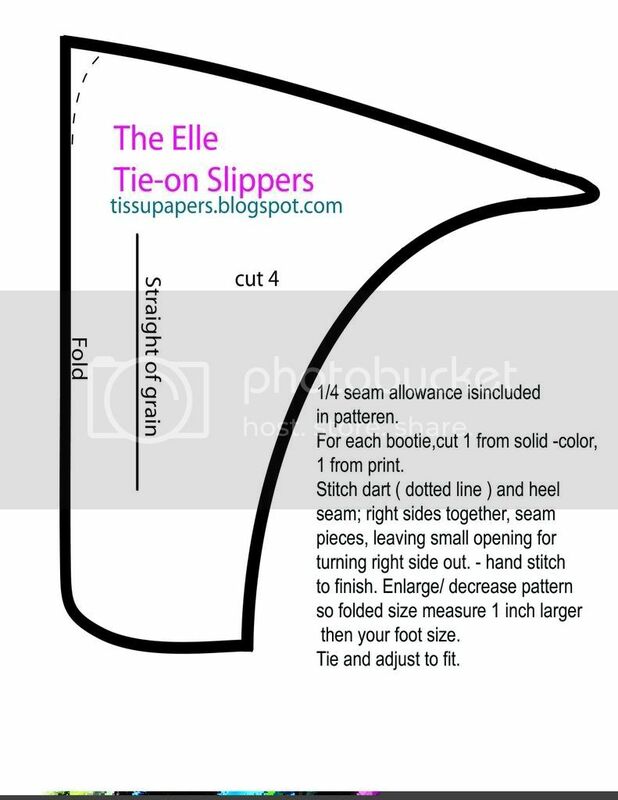 For your fashionable friends with cold toes, sew up a pair of tie on slippers to wear around the house. This project will work best with a sewing machine but can still be done with thread, needle and patience. If you’ve always wanted to learn how to crochet but never had a reason to learn, here it is. These adorable little owl friends can be made with a minimal amount of material and are sure to please. This is for a crafty maven with a few extra hours on her hands. Grab a few yards of organic bamboo, hemp or cottom fabric and your sewing machine for this gift. 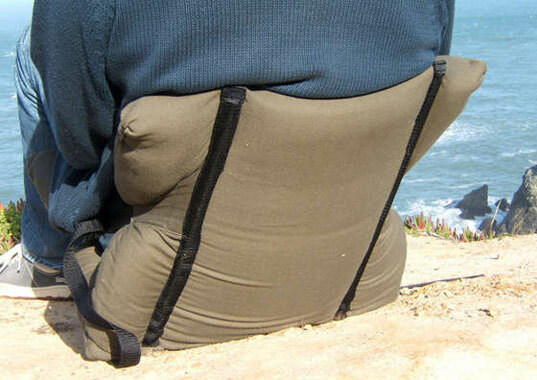 For campers and sports fans alike, a carry-along chair will keep tushes cozy and warm wherever they plop down. This gift designed for high usability will take some time and patience so start early. Homemade gifts are always cherished and add a personal touch to the season of giving. They're also easy on the pocketbook, and we know that will appeal to lots of you out there in these tough economic times. Since we all have different levels of craftiness, we've listed our DIY gift ideas here in order of complexity: simpler DIY ideas for the novice are at the top and projects for seasoned crafters at the bottom. Many of these projects require buying fabric or other raw materials. Keep it green by choosing organic, local, pre-loved or sustainably sourced goods.